This 20-minute period will totally challenge your strength and endurance, and burn fat like you wouldn't believe. Each exercise is performed one after the other, back-to-back, with little to no rest in between. It's intense! It's not as easy as it looks (trust me), but you'll get good at it once you start and stay with it.. Not to mention, you'll be hooked once you feel and see the results! Before you begin, please scroll down to read my quick tips and advice. When doing the warm up, if you don't have space to run, just run on the spot and/or do jumping jacks. Whatever your fitness level, make sure you start slow and go at your own pace. Work according to your fitness level — it'll be challenging no matter what your fitness level, especially when you start adding heavier weights, moving faster, doing lower squats and making higher jumps. Finish off with 30–50 reps of Torso Twist (with or without weights). It's a total of 30 minutes (5 minute warm up, 20 minute intense workout, and 5 minute cool down stretch). Don't be deceived by the fact that it is a 20-minute workout. It is insanely intense! You'll burn up more calories than most people who putt around the gym for an hour or more; when it comes to maximizing calorie-burn, it's not always about how long you workout, but more about the level of intensity. So make sure you start slow and go at your own pace, work according to your fitness level — it'll be challenging no matter what your fitness level, especially when you start adding heavier weights, moving faster, doing lower squats and making higher jumps. If you're not use to working out like this, then just watch this short preview for fun, and wait till I post the full 30-Minute Body Blast Bootcamp next week. That way, you can join me and do it along with the entire class from warming up, going over proper form, executing the workout, to cool down stretch. :) It'll be fun! 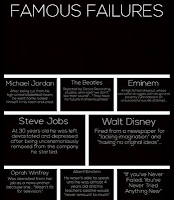 World famous failures are also world famous successors! You cannot learn or grow from a place of total comfort and familiarity... only obstacles and challenges can exercise the muscles of your mind, heart and spirit. And this is why "failure" or "mistakes" seem to be the only path to growth, expansion and success. There is no way around it—no short cuts. And even if you do find a short cut, it will be short-lived. "Failure" is inevitable if you want to achieve success. Paradox? Yes, perhaps. But that's life. Failures are indeed blessings in disguise... however, it is a blessing that can move in your favor under one condition—and that is, if you deliberately choose to see it as an opportunity to learn and create a greater good, not delve deeper into the sorrow and self-pity. The choice is always yours. Just remember: nothing can be a "mistake" if you've learned from it. Truly, you can always find something to learn from every mistake. Study your favorite people and you'll find that their success did not come without "failures". Don't resist this natural flow of life, embrace it as an opportunity to achieve more. 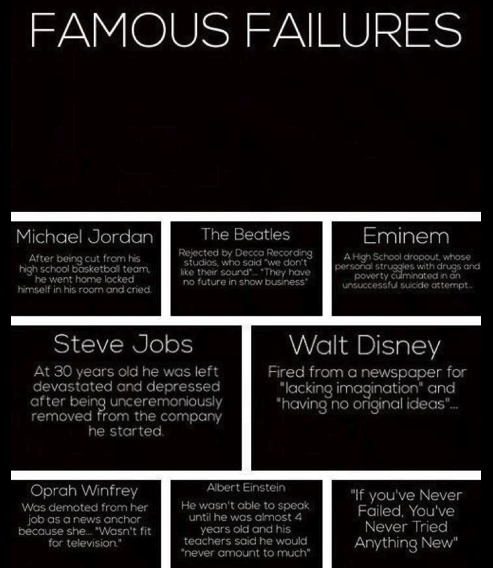 Change your perception of failure into a positive one and your success will follow. 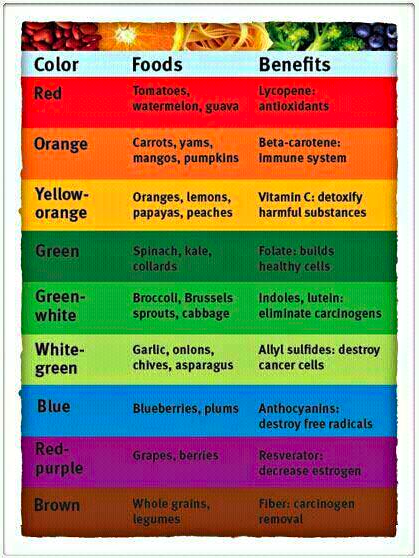 This is one of the reasons I encourage you to eat foods that are alive, colorful and vibrant. 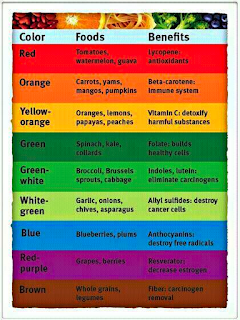 These foods have rich colors because they're alive and have various nutritional properties; the colors, in most cases, indicate the kind of health benefits they contain. So eat right to complement your health and fitness efforts because you deserve to look and FEEL your best! If your daily meals don't consist of foods that are alive, colorful and vibrant, then you cannot expect your body to feel alive, colorful and vibrant. Too lazy to cook? No problem! Just toss these ingredients together to make a colorful salad. You’d be amazed at how good the combinations of these flavors will taste!